FiDO plays ZAPPA – the Swiss 10 piece orchestra – has been one of my absolute favorite Zappa tribute bands since I first heard their CDR, FiDO plays ZAPPA Live @Sudhaus Basel in 2007, followed by their incredibly energetic 2008 DVD, FiDO plays ZAPPA on the Dental Floss. 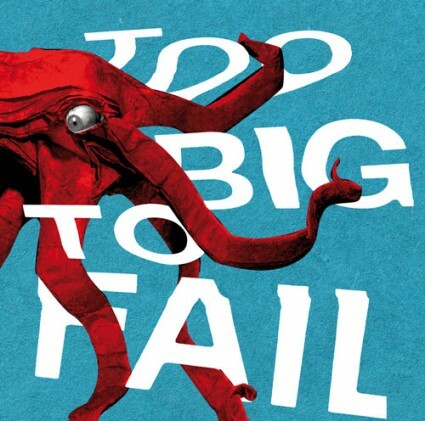 Now in 2011, FiDO plays ZAPPA present their first studio album: Too Big To Fail. Final analysis. Pick this one up. Is that the octopus from Peter Engel’s Origami from Angelfish to Zen? Sounds like a bunch of drunken sailors in an (empty) quayside bar to me. It is ok if someone has fun doing this live on stage, but why record this in a studio and put out a CD? half of the 88 band meets Lumpy Gravy in an acoustic mood. Having listened to FZ’s 73 and 74 ensembles heavily, what FpZ do on this CD isn’t really too much different from what Zappa and his own musicians did. They just mixed it up a little differently. Listen a little closer. In that case it would be even more superfluous (for me). But seriously: I can see no sense in trying to imitate stuff somebody else already did in perfection. At a very superficial first listen, this sounds like something I would enjoy in concert, but I don’t crave the CD – just as I really enjoy ZPZ in concert, without ever feeling an urge to buy their CDs. I might be wrong but it seems to me that you react of what Urb had said, not the music. On the other hand (I think) he only noted that the attitude is similar to FZ’s – if you listen again, you’ll see that the music really has it’s own life, does NOT imitate FZ at all – on the contrary: it’s very much a free interpretation of the original. The real vaule is exactly this (to me): hearing the same tunes but through another perspective – with fun an with musical pefection. Very zappaesque – not imitation at all. I did enjoy the Musician’s Salary track, although Thinman’s comment about drunken sailors is rather appropriate. I wonder how they would interpret Naval Aviation In Art? Obviously Thinman is not a big fan of bands that cover Zappa material (which is his right, btw). Certainly, the innovative and fresh interpretation of Zappa classics that draws me to listen to these FZ covers will never replace the originals. That said, Thinman has every right to like or dislike whatever piece of music he hears. It’s a matter of taste and a matter of personal opinion. I like it… its got its own nice feel and all. I think some of the worst FZ covers were done by FZ himself… so its nice when people of pull of something different and do it well. I do agree though that I prefer an FZ cover in a live context… the only FZ covers in the studio I play regularly are Ed Palermo’s. @urbangraffito: That’s probably right, though I never thought about it. It must be very simple for me: I concentrate on FZ’s lifetime official releases, because he was good in selecting releasable material. I never have been too enthusiatic about bootlegs and covers. Out of the many FZ cover-projects I know (and own, BTW) there is only one I really can enjoy so far: Ensemble Ambrosius – The Zappa album. Well, one man’s cover is another man’s toilet paper, I suppose….! I’m definitely interested in others, as this is an older example. But I love these guys! I remember one track by Picchio dal Pozzo from a ReR sampler, Uccelin’ del Bosco – very good, heavy RIO! Ensemble Ambrosius is extremely worthwhile, they even nailed the improvisations, as in Zoot Allures and Inca Roads! The best alternative for laid-back, baroque interpretations of Zappa for sure. …I’m definitely interested in others, as this is an older example. But I love these guys! Do you know the Swedish band Samla Mammas Manna? They are also from the seventies, but in my personal top-of-the-pops list, they belong right next to Zappa. Have a listen to this Lang ner i ett Kaninhaal (Way Down a Rabbithole). Listening to Musican’s Salary now – the music is swaying, as drunken sailors are wont to be. I was thinking about all the FZ-covers on the album, not their own tunes, because the discussion was about whether they are “just the same again” or do they have their own value. (At least I thought) the “drunken sailor” thing was also about the covers, on which I was pretty surpised. …anyway, I keep on listenning (loving) to this album drunken sailors or not, usually after Make a Jazz Noise. Hehe. It sure is interesting to note that they model their Black Napkins after the Jazz Noise arrangement, and add their own special flavour. And isn’t there even a 1988 sample in Musician’s Salary (from the Jazzy Seamen’s Church)?